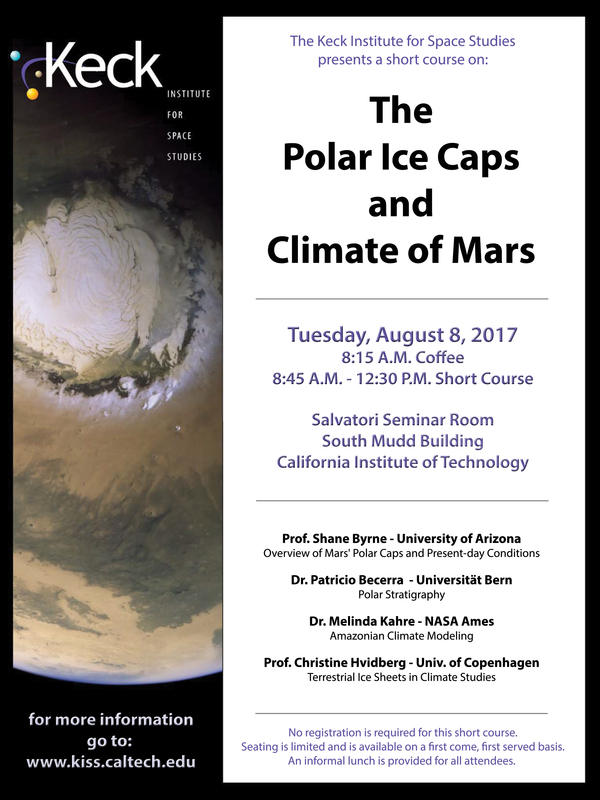 Prof. Shane Byrne - University of Arizona - "Overview of Mars' Polar Caps and Present-day Conditions"
Dr. Patricio Becerra - Universität Bern - "Polar Stratigraphy"
Dr. Melinda Kahre - NASA Ames - "Amazonian Climate Modeling"
Prof. Christine Hvidberg - Univ. of Copenhagen - "Terrestrial Ice Sheets in Climate Studies"
Earth’s climate is governed by a complex system of intricate feedback mechanisms. On Mars, we have the opportunity to understand the climate system of a simplified terrestrial planet without the complicating effects of oceans, vegetation and human activity. Mars’ layered polar ice deposits show variations in ice and dust accumulation, possibly representing a detailed climate record – if only we could read it. In this short course, we explore what information may be recorded in these icy layers, and their links to martian climate models. Much information about Earth’s climate has been gleaned from analysis of cores of similar ice sheets and we will also discuss these techniques and their potential application to Mars.